Resonant snare drumheads – also known as snare side drumheads – can be a big source of confusion for a lot of drummers out there. This article is here to clear that up, and give an overview and comparison of all the different resonant snare heads available from the three big brands: Aquarian snare side heads, Evans snare side heads, and Remo snare side heads. 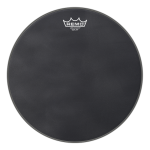 Tip: Looking for info on resonant tom and bass drumheads? This is the article for you! What does snare side mean? The snare side is the bottom of your snare drum, it’s the side the snare wires are on. This page has important info on resonant snare head thickness and features, and (most importantly!) the different sounds you’ll get depending on the different resonant snare head types available. As well as being poorly understood, snare side heads can be the most overlooked drumhead on a kit, and one of the most overlooked pieces of backup gear… If your snare side head breaks mid gig, it’s game over, so always keep a spare in the bottom of your snare bag. Having a backup snare drum is best, but carry a spare snare drumhead as a bare minimum. You can keep spare heads in the bottom of your drum bags. Read on to find the best resonant snare drumhead for your kit! Tip: Unsure of what something means on this page? Take a look at the Drum Sound FAQ for explanations on all of the important stuff. What is a Resonant Snare Drumhead? The resonant snare drumhead, also known as the snare side drumhead, is the bottom head on your snare drum. It’s the drumhead that you don’t hit. In fact, make sure you take care not to hit (or damage) this drumhead. 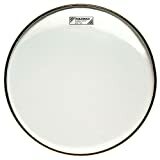 Resonant snare drumheads are very thin: usually 1/2 to 1/8 the thickness of a batter (top) drumhead. Why is it so thin? It needs to be sensitive enough to vibrate from lighter snare touches, otherwise your snare wires won’t respond well. A regular batter (top) drumhead, even a thinner one, is far too thick to use as a snare side head… With a thick resonant snare head, your snare will sound boxy, dark, and the snare wires will only respond when you beat the hell out of it. If you’re looking for this sound, then by all means go ahead and try it. For general purpose drumming though, it’s a bad idea to use a batter head on the snare side! Okay, so how do I choose a Resonant Snare Drumhead? The key factor when choosing a snare side drumhead is the thickness, and your choice here depends on how hard or soft you play. Resonant snare drumheads come in 2mil, 3mil, and 5mil thickness (1mil = 1 thousandth of an inch – really thin!). Thinner resonant snare heads respond better to light touches and quiet playing, while thicker snare side heads are designed for loud playing and will last through a lot of abuse. Besides thickness, resonant snare heads can have different features which change the sound. Generally, clear snare side heads are the brightest sounding (e.g. the Evans 200), followed by hazy (e.g. the Diplomat Hazy Snare Side), with coated resonant snare heads being the warmest (e.g. the Ambassador Black Suede Snare Side). The Aquarian Hi-Performance features a reinforced area to stop damage from snare wires. Most features found on batter heads (like inlay rings, control rings, or control dots) are not found on snare side resonant heads. These things can choke the sound too much, and interfere with snare wire response… The resulting sound can be very similar to using a thicker batter head as a resonant snare side head! So, what is the best resonant snare drumhead? The answer depends entirely on your playing style and the sound you want, with the main factor being the thickness of the resonant snare head. Read on to find the best snare side drumhead for you. Tip: Click on any of the snare side heads below for a lot more detail on their sound and features. 2mil is the thinnest snare side drumhead you’ll find. These heads are extremely sensitive with both drumsticks and brushes, making them the best snare side head choice if you play a lot of delicate touches on the snare. They’re designed for low to medium volume situations (like acoustic rock or jazz), and bring a lot of definition to your snare drum playing. The thin 2mil ply of film gives a crisp clarity, with excellent definition to each stroke, and contributes a bright sound to a snare drum. One of the drawbacks of a 2mil snare side drumhead is your snare can sound thin and lack depth and body, especially in louder situations. The balance of sound is focused more towards the snare wire snap, with less volume coming from the drum itself. Tip: Pay attention to that last sentence, because there’s a useful hint there: If your snare drum is too loud for a particular situation, a 2mil head can cut the volume. Having one of these heads handy for a quieter gig is a great idea. Both of these resonant snare drumheads have a similar sound, and are professional-quality. Sound-wise, the Remo Diplomat Hazy Snare Side is a touch warmer (darker sounding) that the Evans 200. Compared to the thicker resonant snare heads below, however, both of these options are definitely on the bright side of the sound spectrum. For super sensitive and quieter snare drum playing, your best choice is a 2mil snare side drumhead. Pair it with a thinner batter snare drumhead for maximum responsiveness. 3mil is the “standard” thickness for a resonant snare side drumhead. If you’re replacing the one that came with your snare drum, it’s most likely 3mil in thickness… This is the sweet spot between giving good snare wire responsiveness, while also providing more durability and a fuller sound. A 3mil resonant snare drumhead is the most versatile option if you’re playing a variety of music styles, or if you need a good general-purpose resonant snare head. Sound-wise, 3mil resonant snare drumheads give slightly more depth and body to your snare drum sound compared to a thinner 2mil head. They allow more energy to be transferred to the drum shell, which gives more volume to each stroke. The small increase in thickness also means that snare wires will respond slightly less than a 2mil snare side head, although for most styles of drumming there is still plenty of sensitivity. The Aquarian Hi-Performance has small reinforced patches where the snare wires sit against the drumhead, adding extra durability. If you like to tighten your snare wires or throw them on and off a lot, this is the best snare side option. The Aquarian Classic Clear Snare Side, Evans 300, and Ambassador Clear Snare Side all have a similar balanced sound, with a touch of brightness. The Remo Ambassador Hazy Snare Side cuts the brightness slightly, while the Ambassador Renaissance Snare Side takes this a step further thanks to the thin frosted coating. For a good all-round snare side drumhead, a 3mil head is an excellent choice. These are versatile across a huge range of drumming styles. As far as snare side drumheads go, 5mil is a very thick resonant snare head option. If you’ve been following this article, you’ve probably figured out that this means much less snare wire response. Very soft snare strokes won’t come through clearly, and your snare drum can sound boxy when lightly hit. 5mil snare side heads sound warmer, darker, and will give a lot of depth to your snare drum sound, especially when hit hard. 5mil thick snare side heads reduce the brightness of your snare drum, and can produce a big sound when hit hard. If you play high volume music, this can be a good choice… Your snare will sound beefy, and you’ll have enough volume to be sure you don’t get lost in the mix. The darkest sounding resonant snare head is the Ambassador Black Suede Snare Side, due to the suede finish. Some important advice… Get a spare snare side head! It’s a good idea to have two resonant snare drumheads (one on your snare, and one as a backup). First of all, you’ll benefit from having two different snare side thickness options at your disposal if you play a range of music styles. You’ll be able to play different types of gigs, and get different snare sounds in the studio. But, besides simply having more versatility, there’s another really important reason for getting a second snare side head: You need a spare in case your current snare side head breaks. I can’t stress enough how important it is to have a backup when playing a show, or when recording at the studio. If your resonant head pops mid-gig it will be game over, and you’ll have to tell the band (and the crowd) that the show is done. Keep a spare in the bottom of your snare drum case, and you’ll probably forget about it until the day you really need it. It’s also a good idea to carry a spare snare batter head: You can finish a show without a tom, but the snare is much more important. Drumheads break, usually unexpectedly, so don’t get caught out. When you’re getting a backup resonant snare head, think about whether you need a different sound. You’ve seen from this article that thinner snare side drumheads are designed for lighter playing, while thicker resonant snare heads are for drumming loud and hard. If you’ve already got a 3mil snare side head, it can be good to get a backup of a different thickness to give you more versatility. If you sometimes play quieter music, get a 2mil thick snare side backup. If you lean towards heavier and harder music, get a 5mil thick resonant snare backup head. 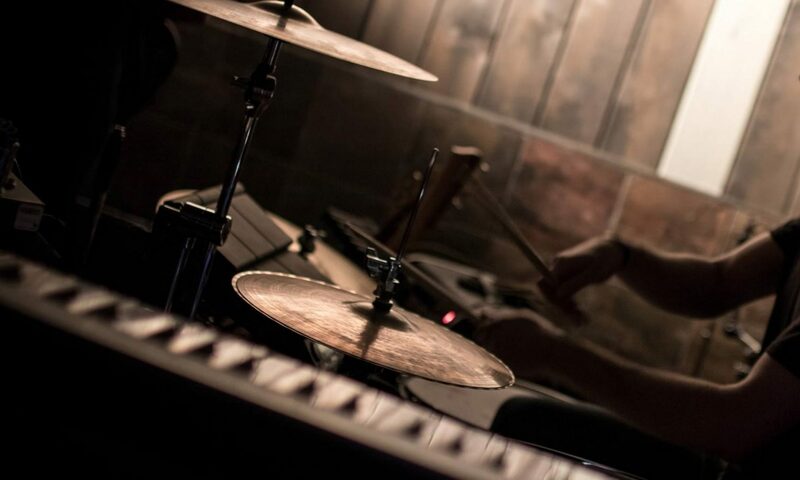 Having a second (and different) snare side head is great for when you need sound options… Use a thinner resonant snare head for those quieter acoustic gigs, and a slightly thicker one for when you want to turn up the volume. If you’ve read through this article and are still unsure of what to choose, go for a 3mil clear or hazy resonant snare drumhead… These heads have enough versatility to play most music styles, and will give you a great snare drum sound. 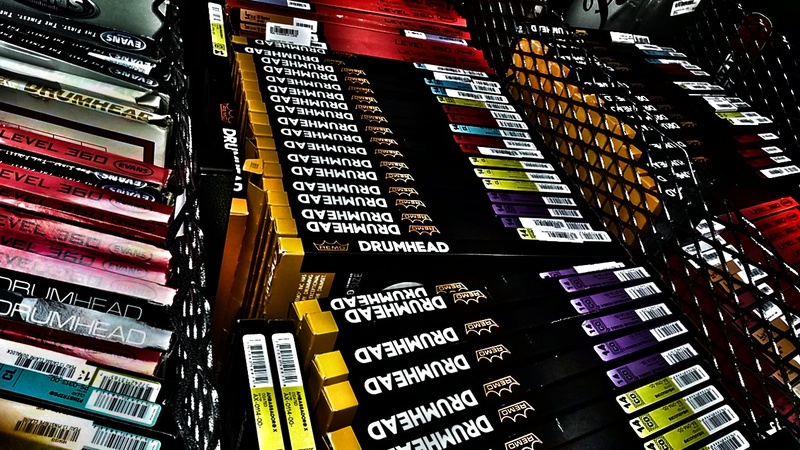 Snare Side Drumheads… What’s In A Name? Aquarian and Remo have both decided to give the same names to their snare side and batter drumheads. This can leave people scratching their heads when shopping for resonant snare heads. 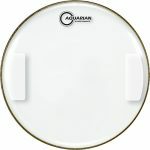 Aquarian has the Classic Clear batter drumhead (a 10mil thick head), and also the Classic Clear snare side (which is just 3mil in thickness). Similarly, Remo has Diplomat, Ambassador, and Emperor batter drumheads (7.5mil, 10mil, and 14mil thick, respectively), and also calls their snare side heads Diplomat, Ambassador, and Emperor (which are 2mil, 3mil, and 5mil, respectively). What makes this even more confusing is the Remo Ambassador Black Suede Snare Side, which is 5mil thick (compared to 3mil in thickness for the rest of the Ambassador Snare Side range). But wait, you want more confusion? Okay! 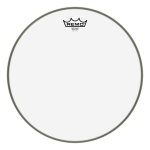 Batter side Classic Clear, Diplomat, and Ambassador heads are very commonly used as resonant drumheads on toms (and bass drums). It’s common to hear people say their resonant head is, for example, a Diplomat when talking about toms. This is not the same as a resonant snare Diplomat. To avoid confusion when shopping for heads, confirm the thickness (in mil) or check for “snare side”, “resonant snare”, “bottom snare head”, or “concert” in the name to be safe! Evans keeps it simple, naming their snare side heads 200, 300, and 500… These are 2mil, 3mil, and 5mil in thickness, respectively. It’s impossible to confuse these with something else… Easy. Thanks Evans. You’ve got your new resonant snare head, but need some help tuning it? 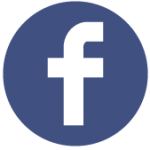 See this page for drum tuning basics, and to check out these drum tuning tips for some useful extra info. These tips can be easily applied to resonant snare head tuning, as well as when tuning the other drumheads around your kit. Resonant snare side head tuning is just as important as the batter side tuning, so don’t neglect it! So, now you need a batter side drumhead to match your resonant head? Find the perfect drumheads for your kit – Compare Aquarian vs. Evans vs. Remo drumheads with the Drumhead Selector, the web’s best drumhead search and compare engine. Filter through the huge range of heads available. Compare any combination of drumheads to see every feature listed side-by-side. 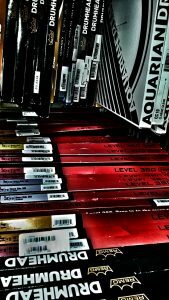 Find the best drumheads for your kit and your sound. Want to see everything listed side by side? 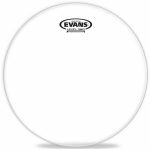 Check out the ultimate drumhead comparison chart to see the equivalent drumheads across the huge Aquarian, Evans, and Remo range.